#REFUEL the Northeast Regional Food Bank with CrossFit Aevitas this January! Charitable contribution has always been a part of the CrossFit Aevitas culture, since we hosted our first region-wide CrossFit competition in Tawasentha Park to benefit the Breast Cancer Research Foundation! Over the past couple of years, we have played around with different formats and ideas aimed at allowing our wonderfully generous community to give back to causes that are important and deserving of our help. About 6 months ago, we kicked off what we have found to be a successful format for giving back to the community – monthly causes that range from small, local affiliations to larger, sometimes even global missions. This allows our community to give back to what’s important to them – which is really what matters! We also want to make sure that we as a business are doing our share to help the community. That’s where the Facebook check-in campaign comes from. We choose a cause that we think fits with our message of lifetime health, wellness, and fitness, and we give our members the opportunity to tell us how much to give to that cause! Every time an Aevitas athlete checks into CrossFit Aevitas on Facebook with the monthly tagline, we donate to the cause of the month. So, even if you don’t necessarily want to give money or donations, you can still support the cause by letting us donate for you! Win-win, right?! Last month, we were able to raise enough money and collect enough tangible donations to provide the Capital City Rescue Mission with over 100 winter items to pass along to those in need this season. Now that it’s actually getting cold outside, the gravity of this contribution is really starting to set in! To read more about our December charity support, see the blog post HERE. We were able to secure a time with the Food Bank on Saturday, February 6th from 1PM to 3PM at the Latham Facility . The Food Bank is able to take up to 10 people in our party, and we want to fill every spot! If you’re interested, please let Coach Karen know either next time you see her in the gym, or via email. As the date gets closer, we will send out reminder emails with more detailed information. For every Facebook check-in to CrossFit Aevitas this month with the tagline #refuel, we will donate to the Food Bank. Each check-in will roughly equate to one meal! So keep those check-ins coming and see how many hungry mouths we can feed as a result! Don’t have Facebook, or sick of checking in every single day? No problem! You can also write a review for us on any online platform, and we’ll count that towards the contribution as well. Most online entities let us know when a review is received, but if you go this route, please notify us via email or let one of the coaches know during the WOD so we don’t miss it and forget to add it to the total! 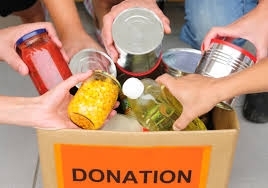 Do you have non-perishable food items left in your pantry after over-purchasing for the holidays? Unload your unwanted bulk food/supplies on us, and start the new year with a clean slate in your kitchen! Or, next time you’re at the grocery store, pick up a couple extra staples and bring them by the gym. Every item counts, so even if your contribution is humble, it will be appreciated! Or, if you would like to just donate money to the cause, please bring in cash or a check to the gym and hand it to one of the coaches. We will add it to our total end-of-month contribution! As always, thank you to everyone for your continued support of the community both within and outside of the gym walls!